Hephzibah. You've no idea what it's like having a freak for a sister. Rebecca. Born first, prettier, Hephzi's always been the more popular one. The Father. When he was busy with his bottle we were usually safe. Usually. The Mother. Her specialist subject was misery and lessons of painful silence . . .
Hephzibah and Rebecca are twins. One beautiful, one disfigured.Trapped with their loveless parents, they dream of a normal life.But when one twin tragically dies, the other must find a way to escape. Because if she doesn't, she'll end up like her sister. This is a book that I struggle to say is good, because while the storytelling is great, the storyline is horrific. Maybe horrific is too harsh, maybe I am a sensitive reader. What I can say is that this is a story that will stay with you. 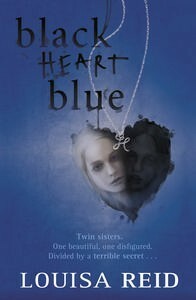 The story is told in two voices, that of twin teenagers, Hephzi and Rebecca. The story moves between present day, in chapters called After told by Rebecca, and 6 or so months earlier, in chapters called Before told by Hephzi. Hephzi has died, and through her chapters we see what happened leading up to her death, and through Rebecca's chapters we learn what happened after Hephzi's death. While the girls are twins, they are not alike. Hephzi would be considered beautiful, while Rebecca is a 'freak'. Rebecca was born with Treacher Collins Syndrome, the bones in her face did not form properly, so she looks different. Up until the age of 16, the girls were home schooled, now for the first time they are heading out into the world to attend the local sixth form college.Hephzi and Rebecca were not only home schooled, but completely isolated from the outside world. Their father, the local vicar, loved by his parishioners, is a horribly drunk, violent and controlling man. Through the course of the story we learn of the horrors the girls were subjected too throughout their lives. Nothing is to in too much graphic detail, but I still found it difficult to read, difficult to contemplate parents with such hate for their children. Going to sixth form college is the first step in an escape plan for Hephzi. At last she can be normal, have friends and even a boyfriend, but this means lying and sneaking and turning her back on Rebecca. After Hephzi's death, Rebecca wonders how she will ever escape. When she takes a part time job at the care home next door, she makes friends and money and starts to see that maybe there is a way out. I don't want to stop people reading this book, but it's not for the faint hearted. It's an incredibly well told story, one where we know that something bad has happened, and slowly the story of what, how and why unfolds. As much as I found it difficult to read in places, I couldn't stop because I had to find out what happened to Hephzi. If anyone out there has read this, I would be very interested to hear your comments.